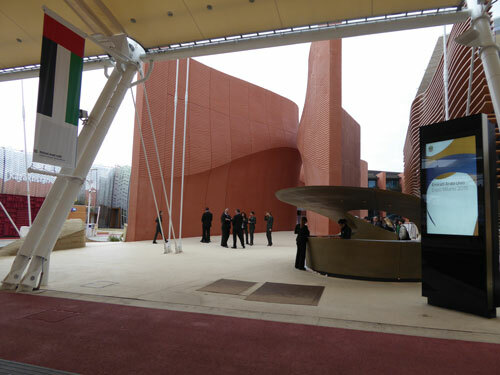 The UAE pavilion, which utilised computer scans to replicate the shape and texture of sand dunes on a series of 12-metre-high walls, spotlighted the topics of food, water, energy, and land to explore the themes ‘Food for Thought – Shaping and Sharing the Future’. Spectacular media exhibits gave insight into UAE’s proposed solutions to global challenges with the help of Panasonic’s class-leading projection technology. From a massive curved screen lit by four 3-Chip DLP™ PT-DZ21K projectors and on to a 3D holographic theatre featuring a further 20 quad-lamp PT-DZ21Ks (a total of 24 units), visitors were immersed in an intoxicating sensual feast. Elsewhere, an array of 12 1-chip DLP™ PT-DZ680 projectors employed ultra-short-throw lenses and mirrors for mesmerising image display on walls and floor. Managing this visual system (and ensuring that no equipment failure occurred) was easy with Panasonic ET-SWA100 Early Warning Software.